Before I took my Padi course I wanted to know about the danger of scuba diving. 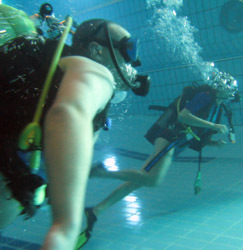 Scuba diving is a 'risk sport' but is a lot safer than many other outdoor or adventure sports. Taking a scuba diving course and learning from an experienced Instructor will start the process of a safe and beautiful journey into the underwater realm. Students receive approximately 30 hours of instruction that begins in a classroom. From classroom to swimming pool and ends up in the open water. Anyone over the age of 12 years with basic swimming skills can become a certified diver. The course is essential to a safe start and there is a lot to learn about scuba diving. In order to minimize risk you increase safety. Maintaining a healthy lifestyle and being in a reasonably good physical shape is a good start. One of my biggest fears was the possibility of a shark attack. We have been so programmed by movies and TV! The odds of a shark attack are the same than being struck by lighting on a sunny day with no clouds. There have been shark attacks but the chances are minuscule. Robert at Adventure Divers in Pattaya once told me when I mentioned sharks to him, that land sharks are much more dangerous. They walk upright and are called humans. Being careless is the biggest risk factor. Not maintaining your equipment is the number one risk factor. That's preventable by checking and maintaining your equipment before every dive. Although rare, there are incidents when even properly maintained equipment can fail. In this rare case you would be using an alternate air source which you learn during your Padi course. Divers minimize the likelihood of decompression through careful planning and gradual ascend. The ascend speed is based on the amount of excess nitrogen the diver's body absorbed during the dive. The diver has to bleed the excess nitrogen out of his system or 'decompress' as you ascend. As the diver descends his system absorbs nitrogen and as the diver ascends, the body reabsorbs nitrogen into the bloodstream. If the diver ascends too quickly the gases form bubbles in the tissues or blood and cause a painful serious condition. Narcosis occurs when too much nitrogen is absorbed by the body. Jacques Cousteau (THE history of scuba diving) famously described it as the 'rapture of the deep'. The increased water pressure at greater depth compresses the body's oxygen and allows the body to absorb increased amounts of nitrogen. It occurs at any depth but more noticably at a depth of about 30-40 meters or 100-130 feet. The effects are impairment of thinking and judgement and perception-altering effects. Reality turns into bizaare images and dizziness and slip into sleep. Divers experiencing narcosis discribe the feeling like being drunk or under the influence of mind altering drugs.